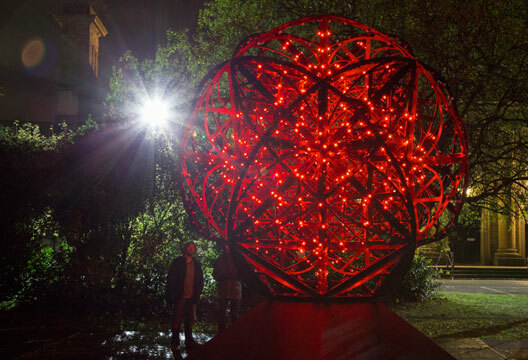 Rising more than four metres high, a mix of steel, 1700 LEDs and 14 speakers, Cosmoscope is an impressive sculpture. The culmination of a two-year interdisciplinary research project funded by a Wellcome Trust Large Arts Award, the creative team includes Professors of Cosmology and Chemistry, an imaging physicist, a programmer, a composer… and a counselling psychologist. Cosmoscope was shown at Lumiere Durham 2017 and Lumiere London 2018, and was the basis of a Durham University public engagement and science outreach project that invited thousands of primary school children to build their own physical, psychological and social universes.